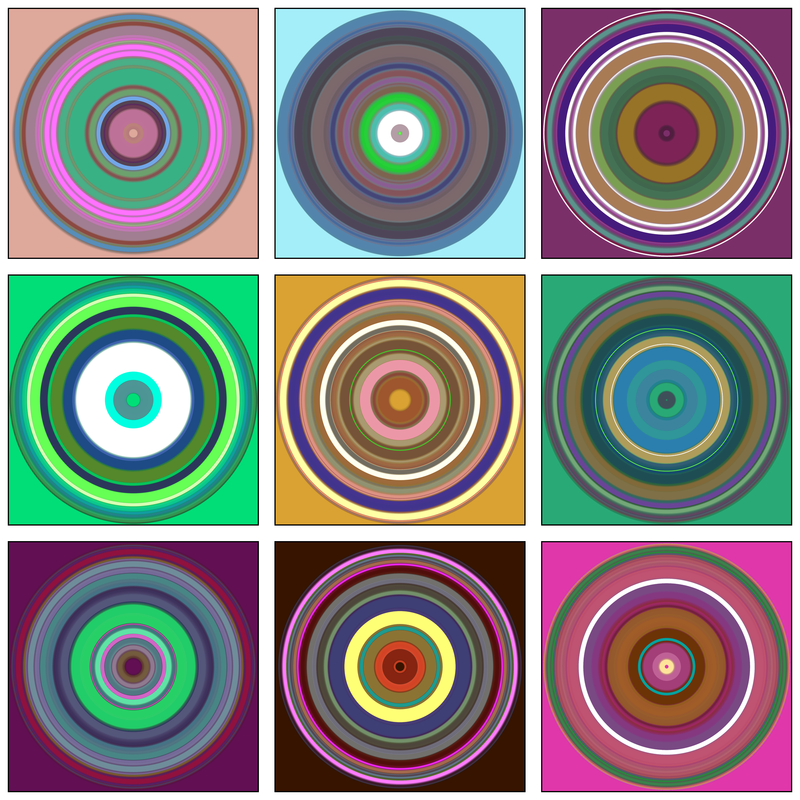 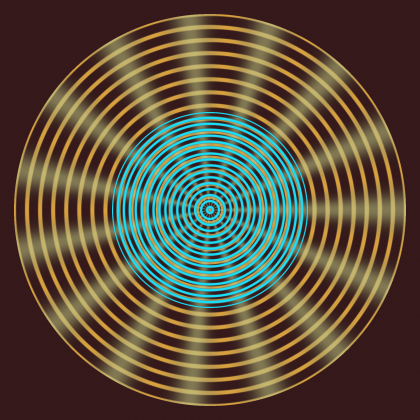 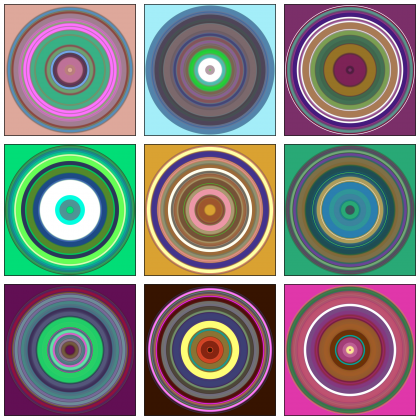 Concentric Stripes after Kenneth Noland. 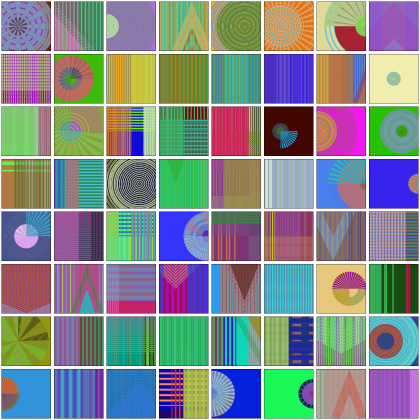 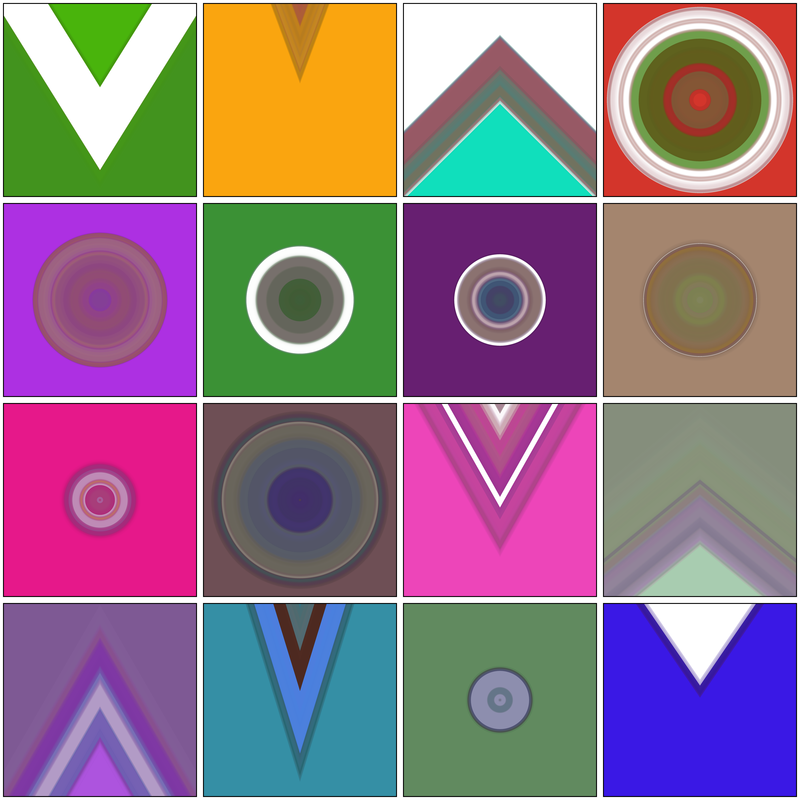 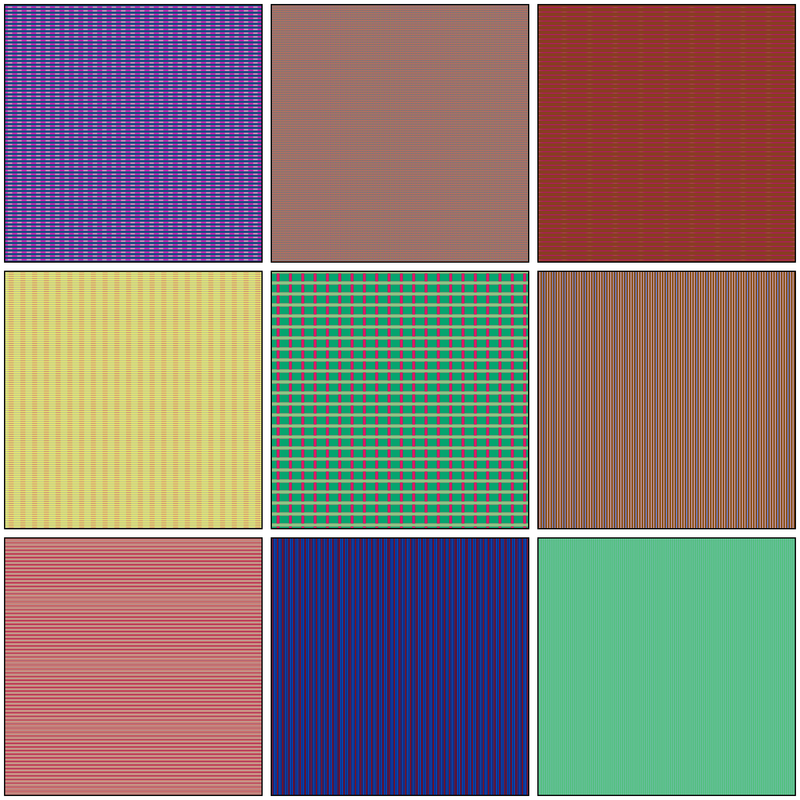 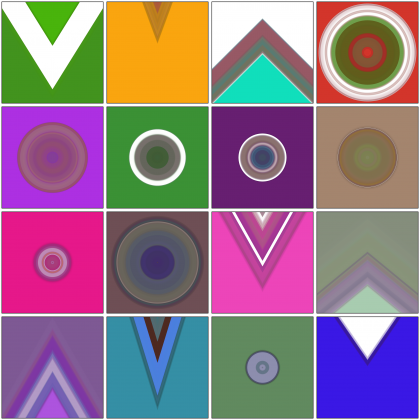 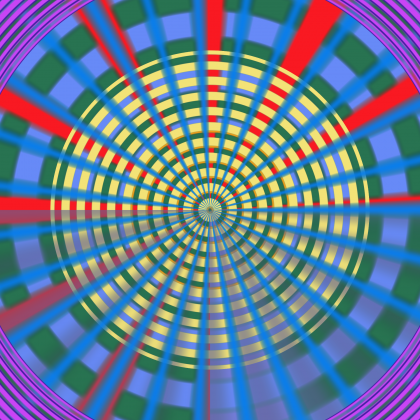 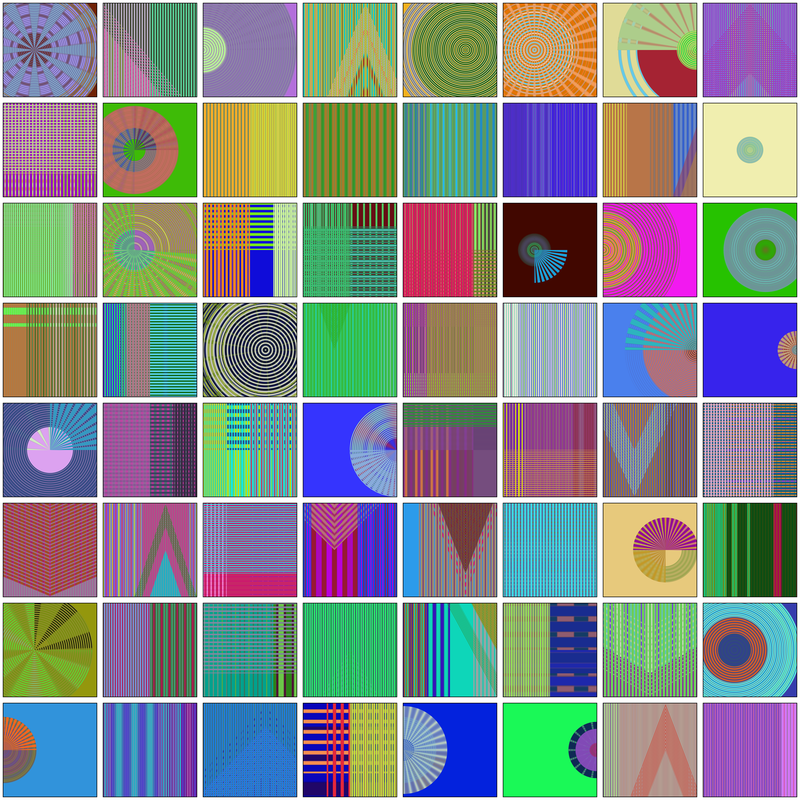 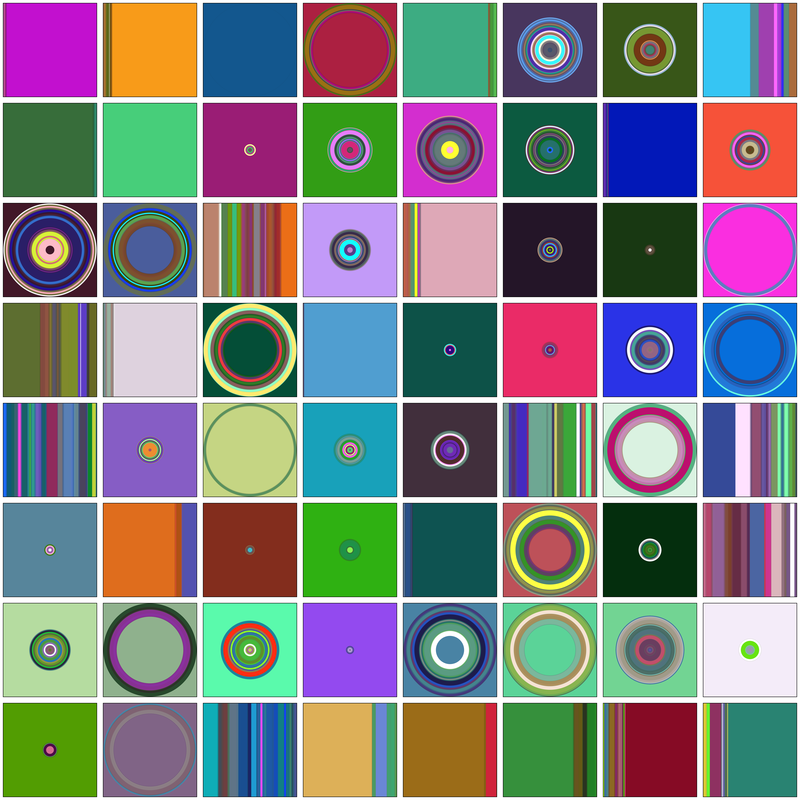 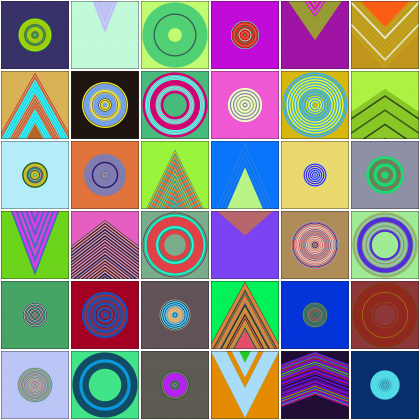 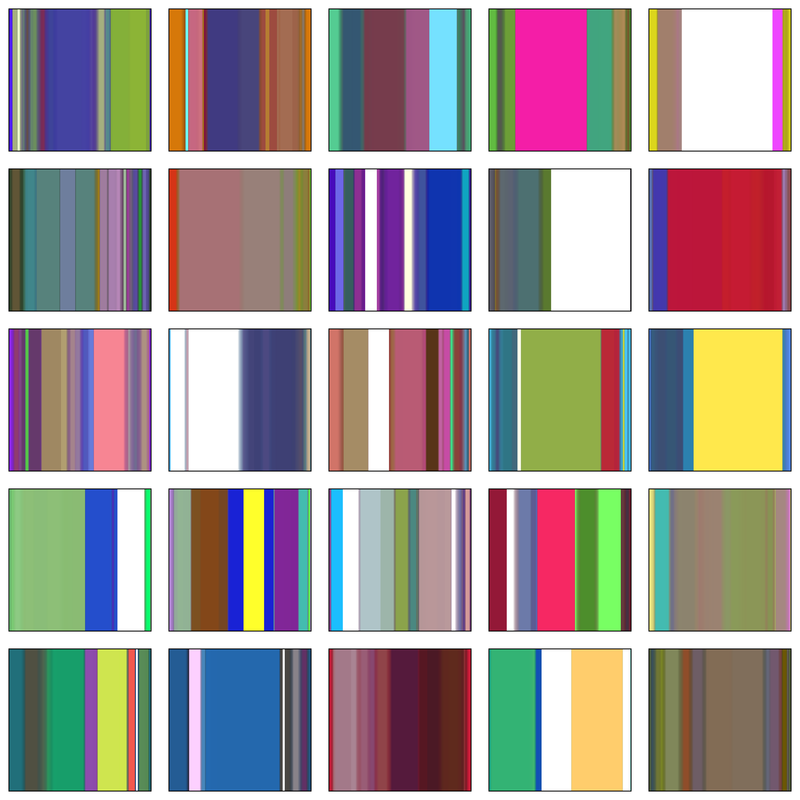 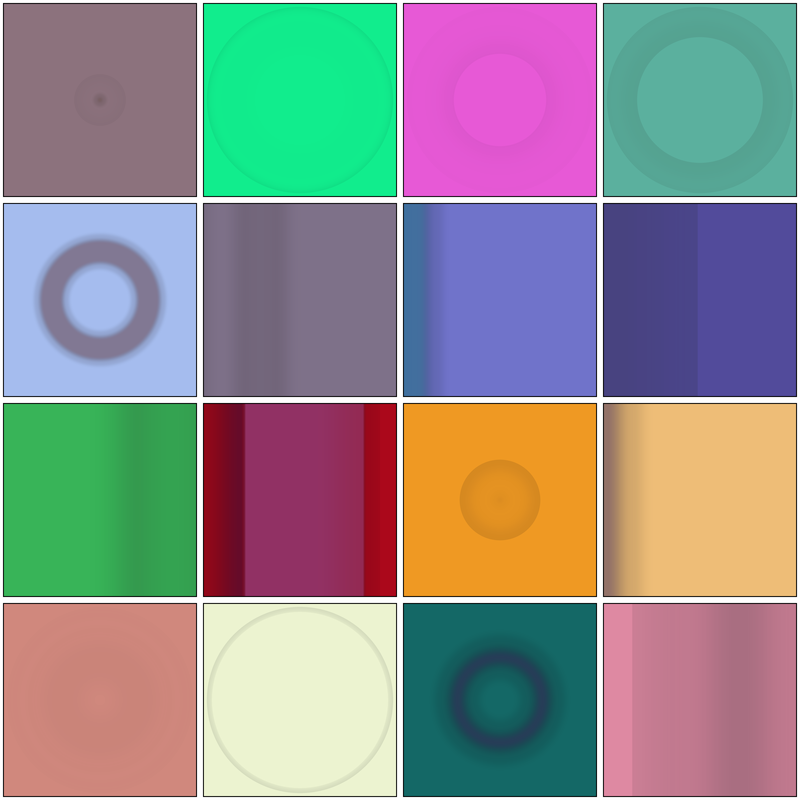 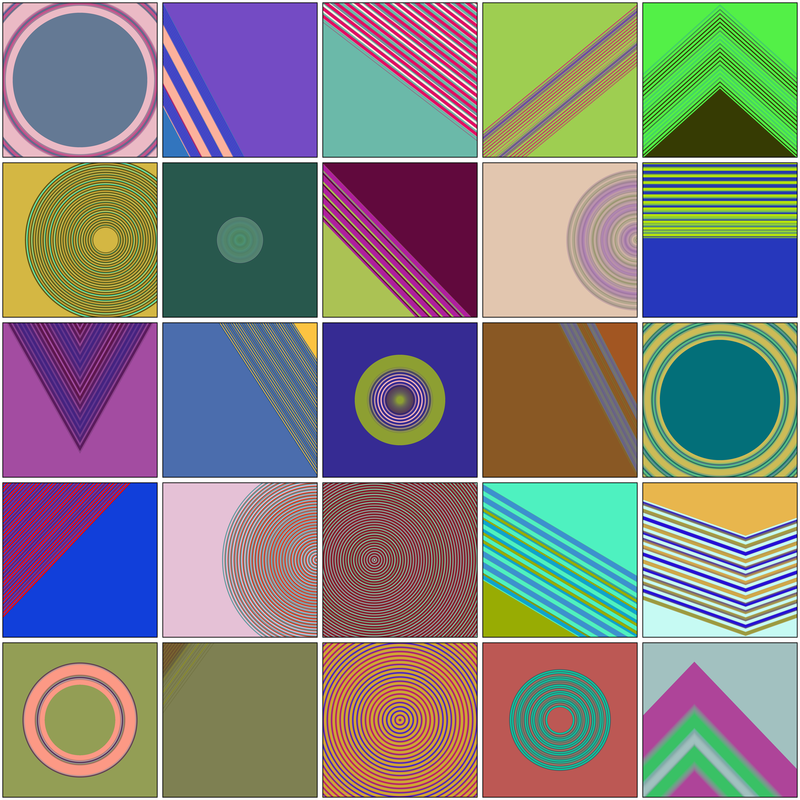 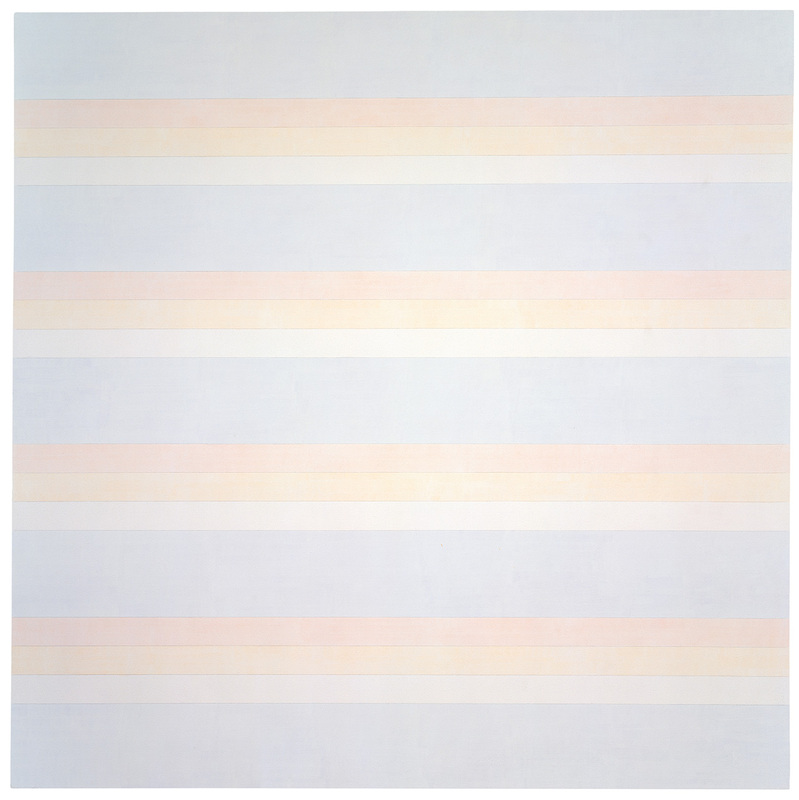 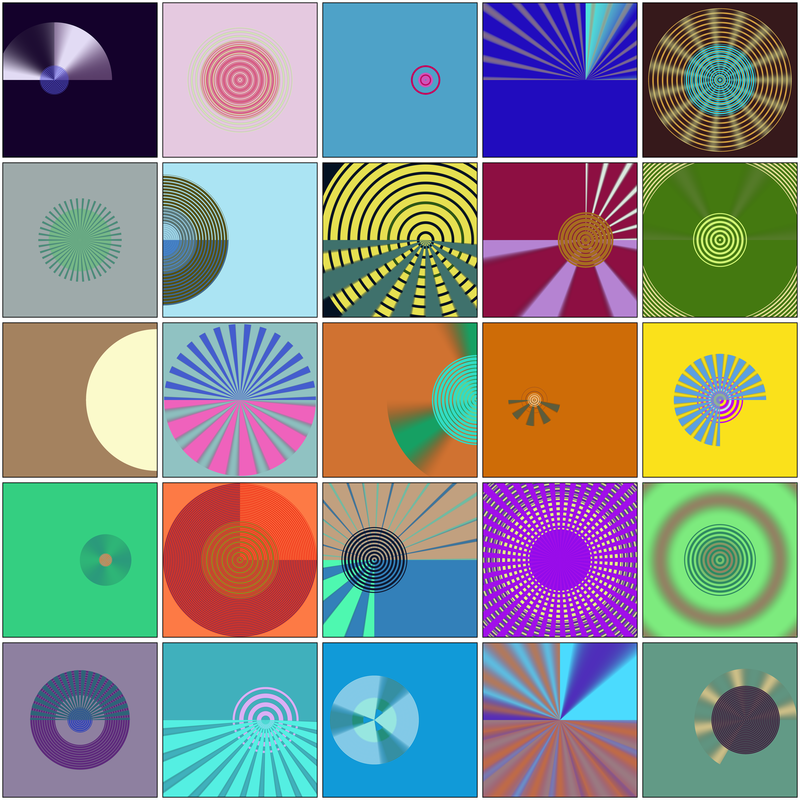 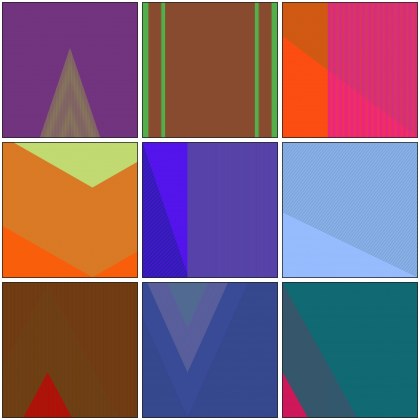 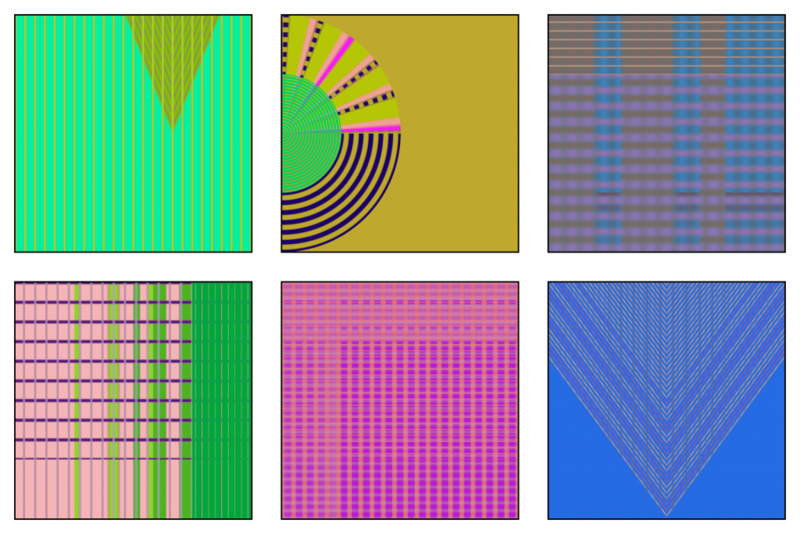 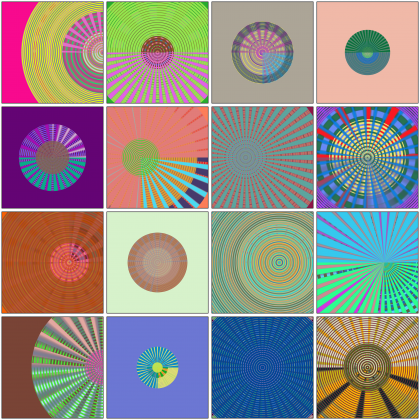 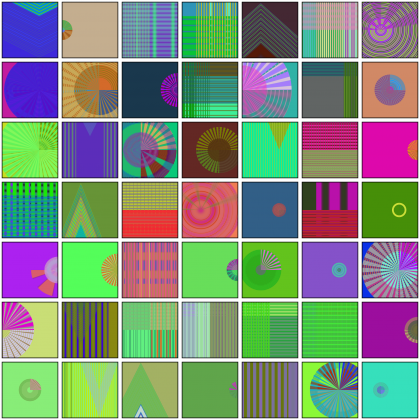 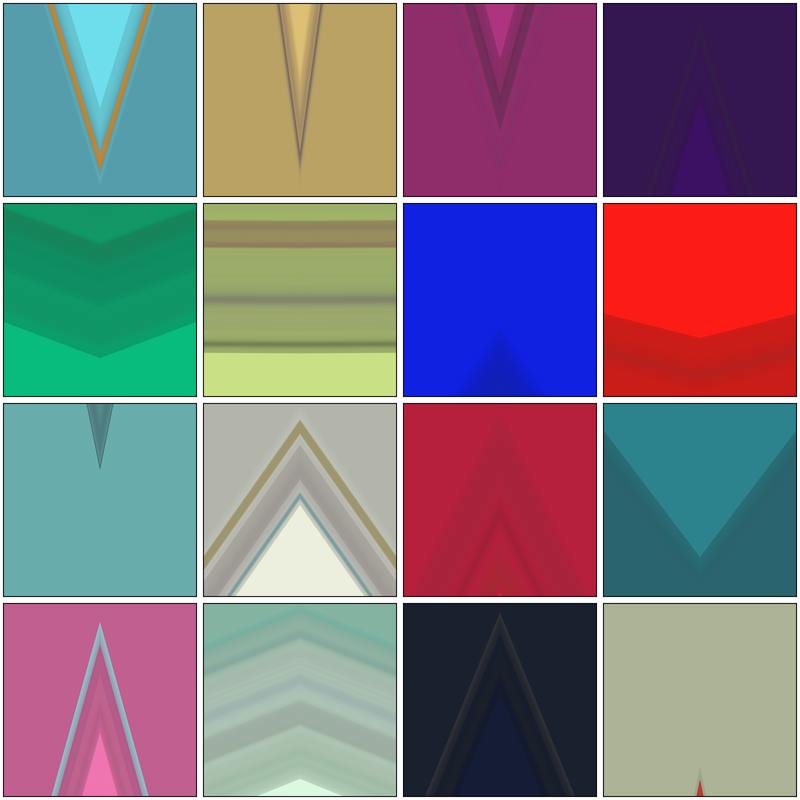 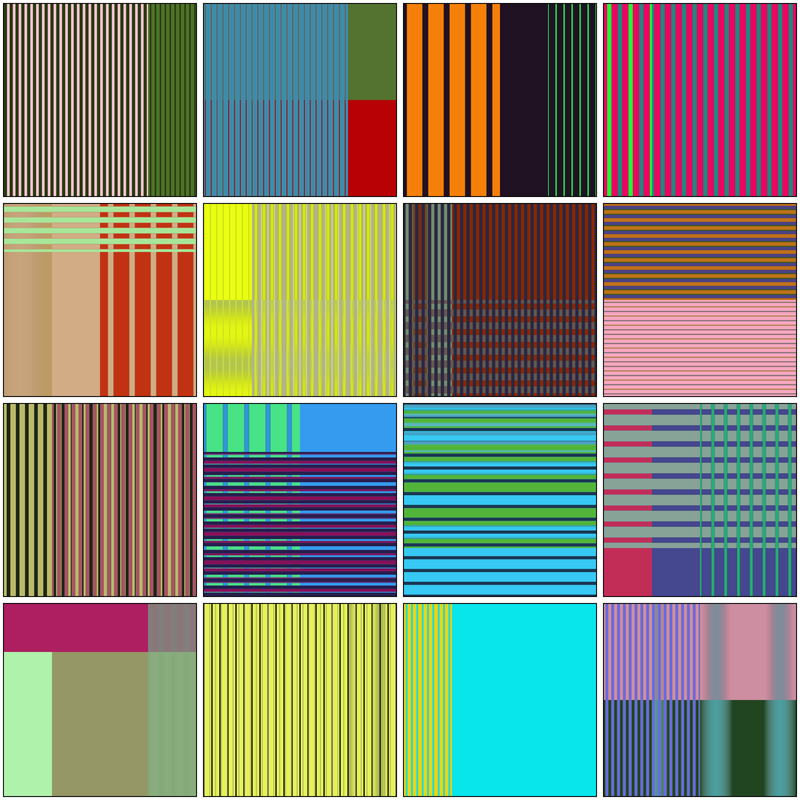 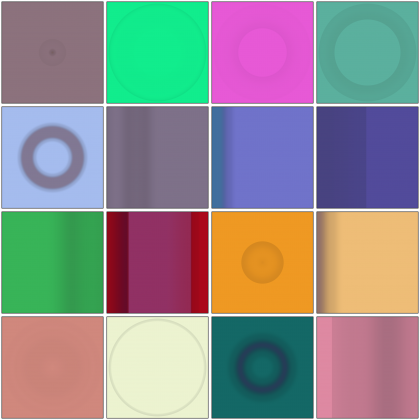 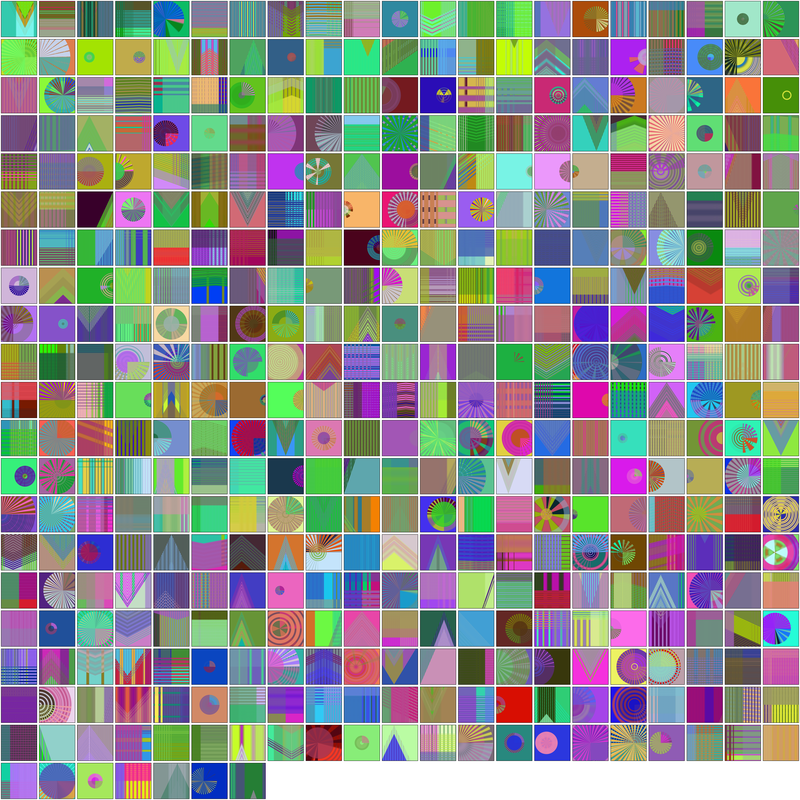 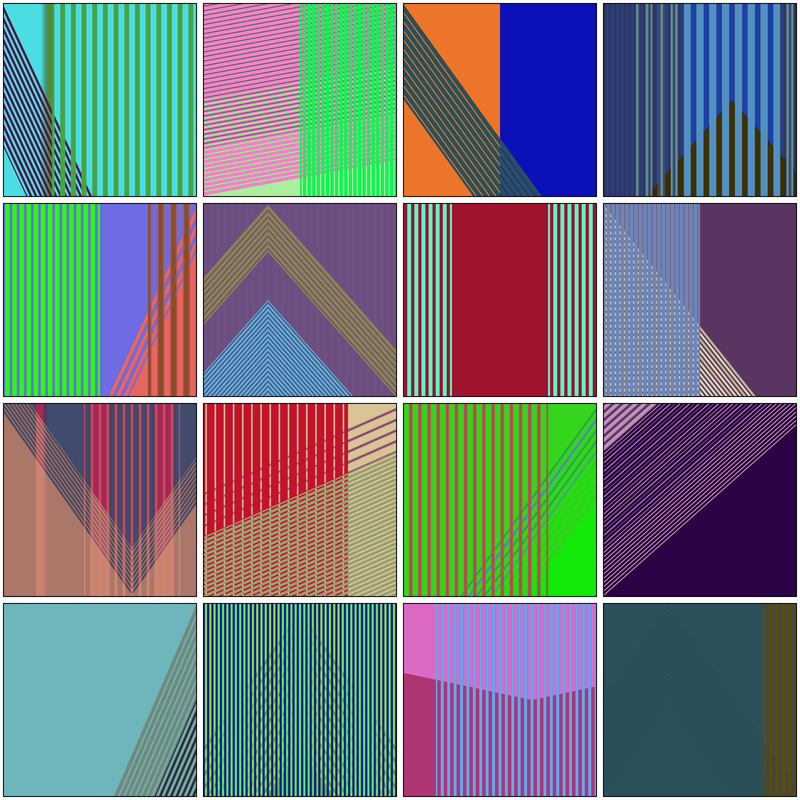 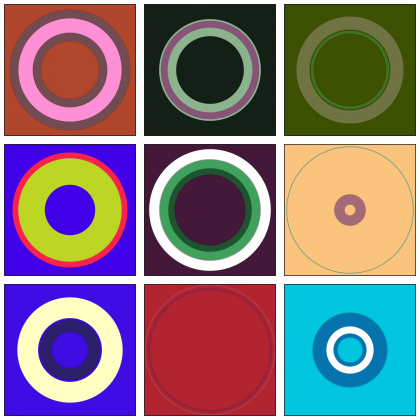 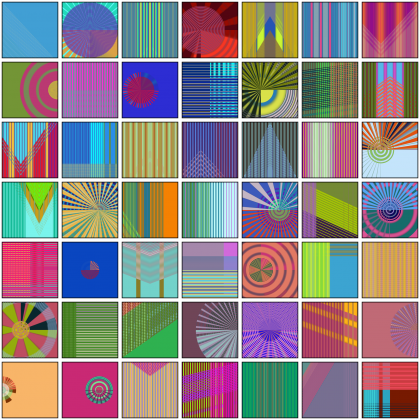 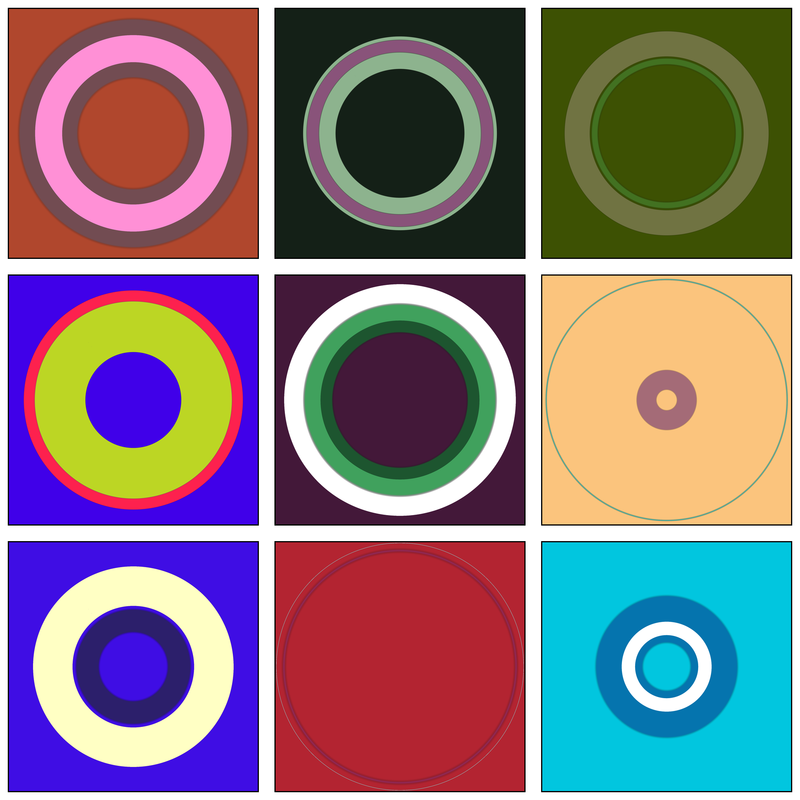 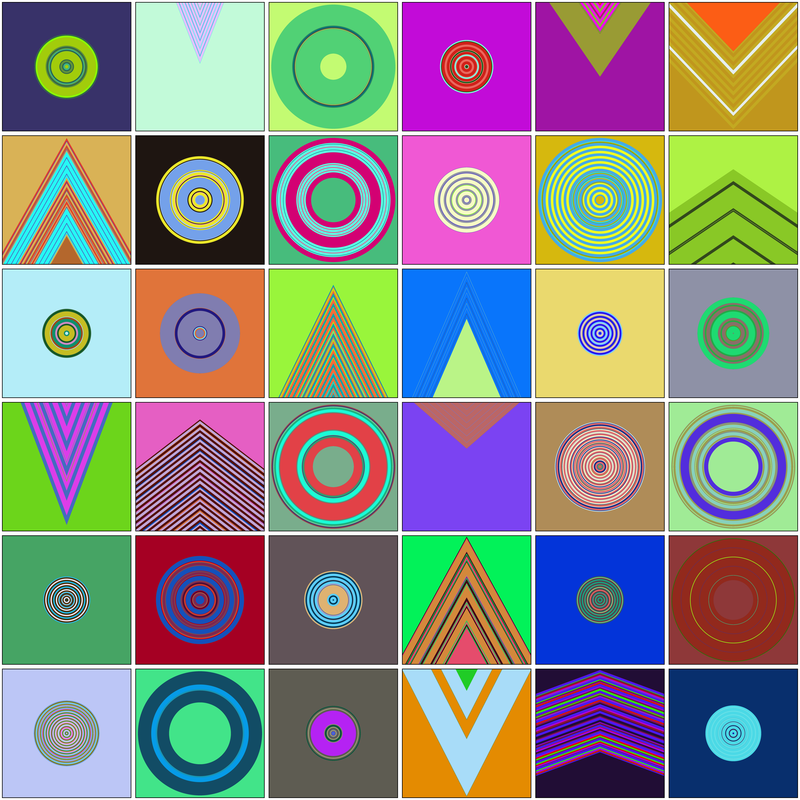 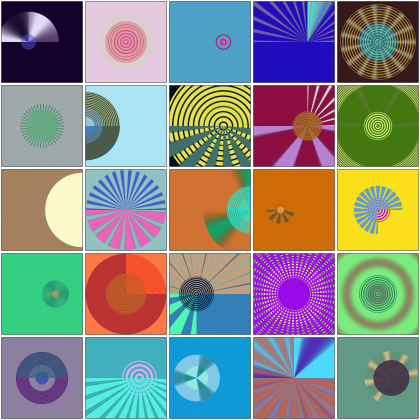 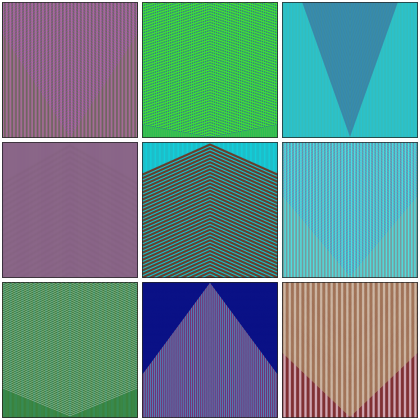 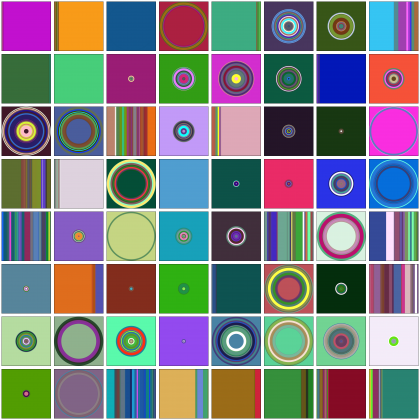 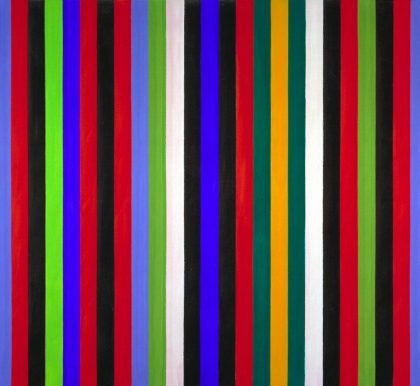 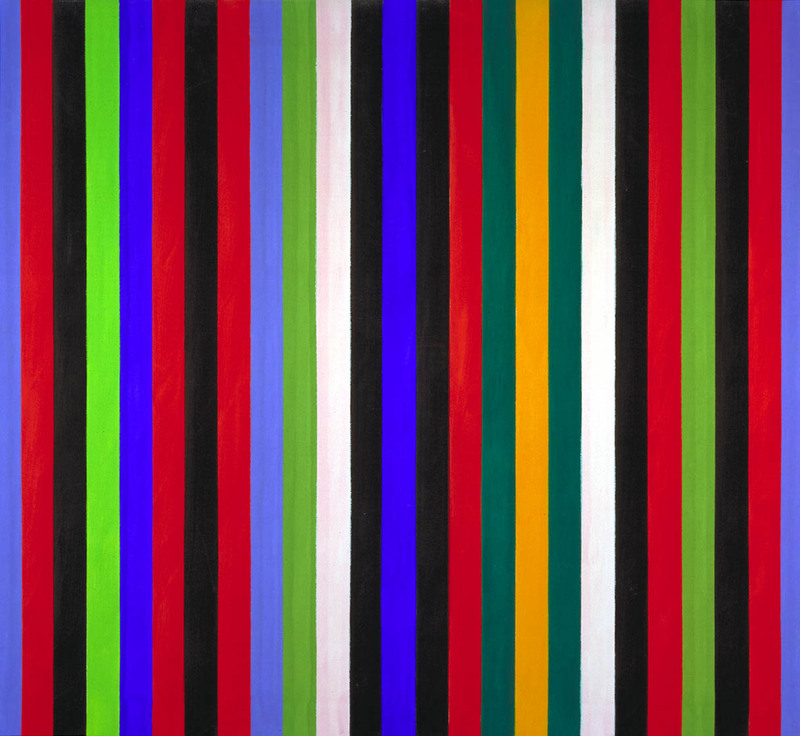 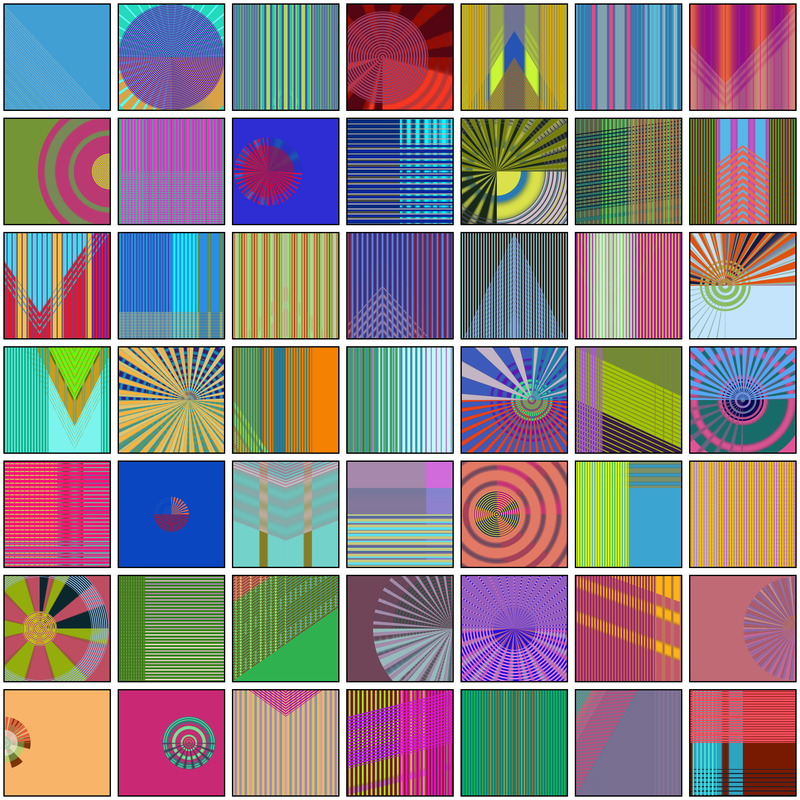 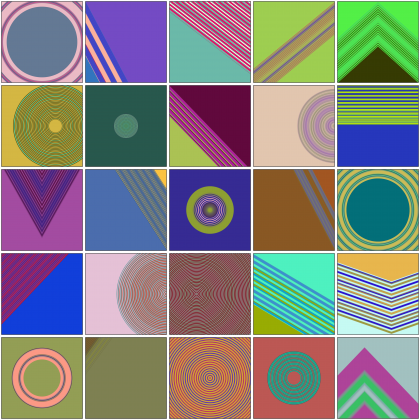 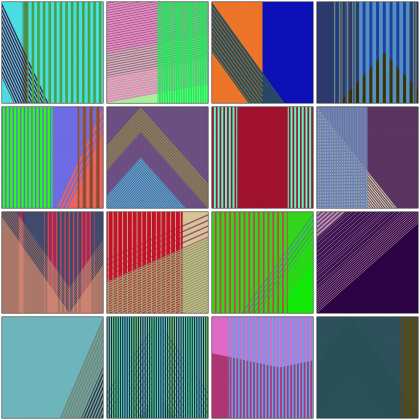 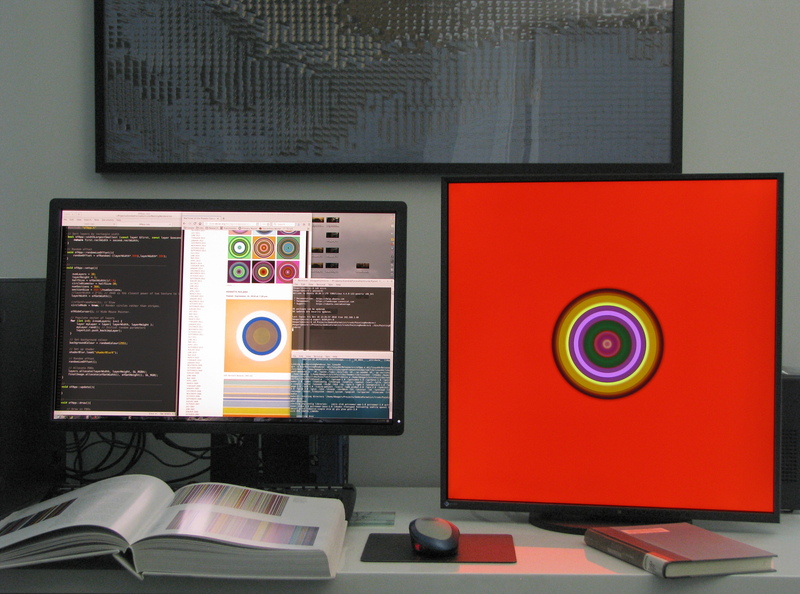 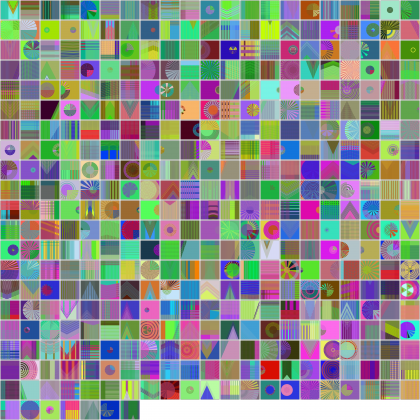 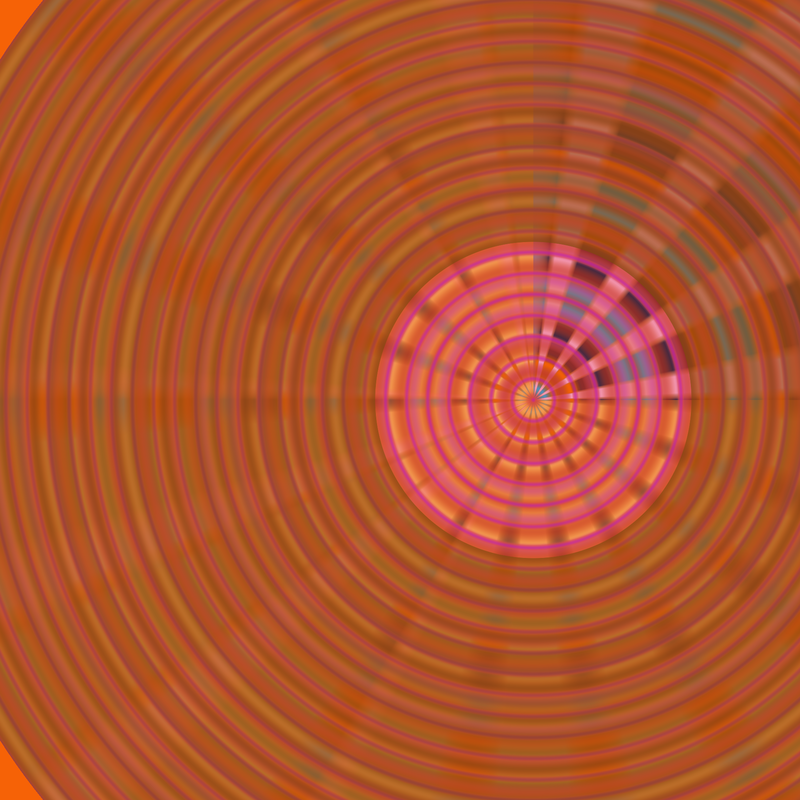 I finished some code that renders stripes as concentrically as inspired by Kenneth Noland. 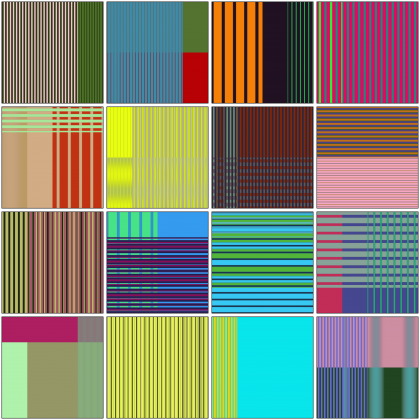 I’ve included a selection with 2 and 30 stripes, respectively. 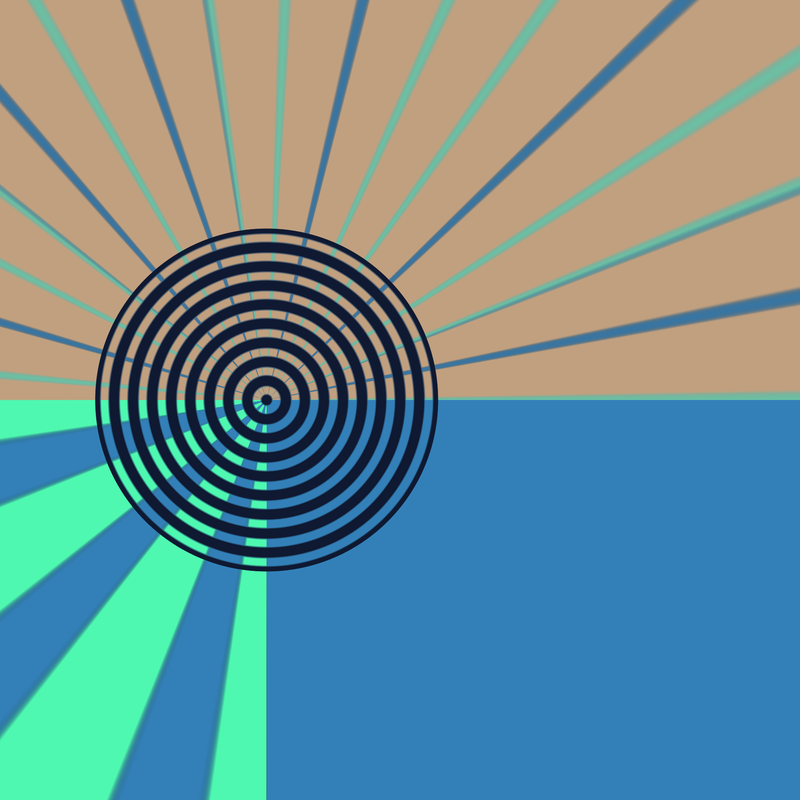 I’m quite happy with these results, but I noticed some aliasing issues with hard-edged stripes and a couple artifacts. 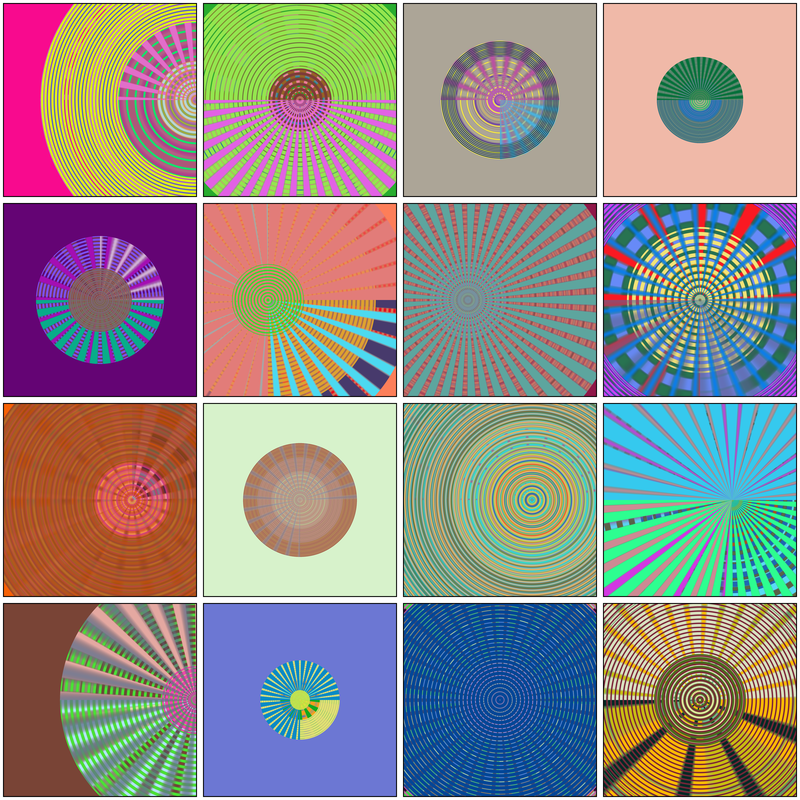 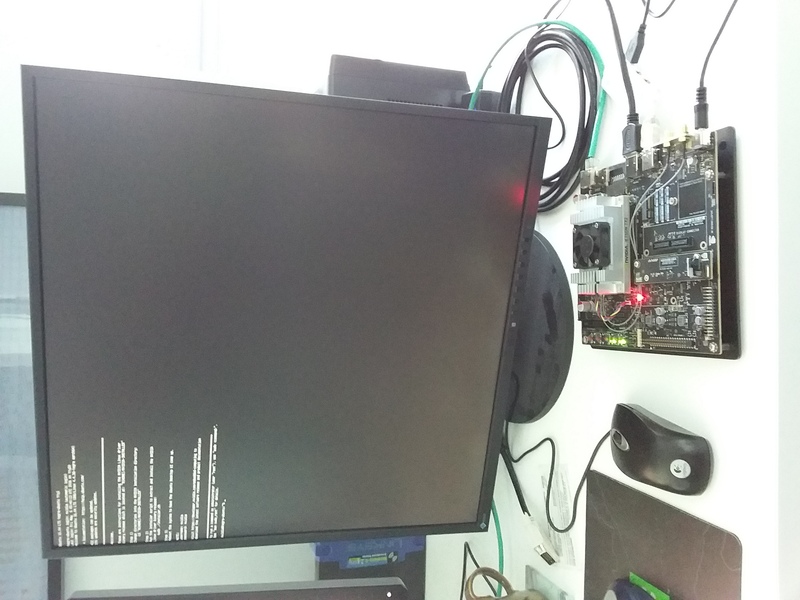 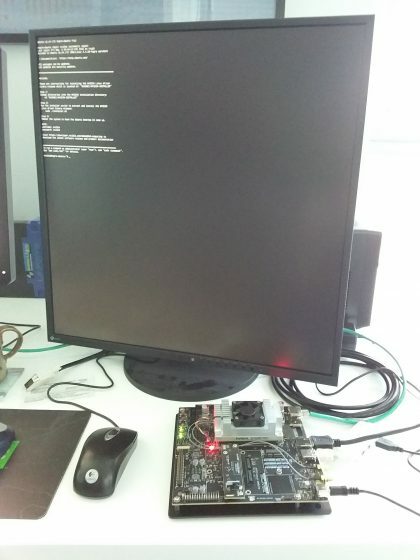 Since these are explorations and not written for the target hardware I won’t worry about it yet. 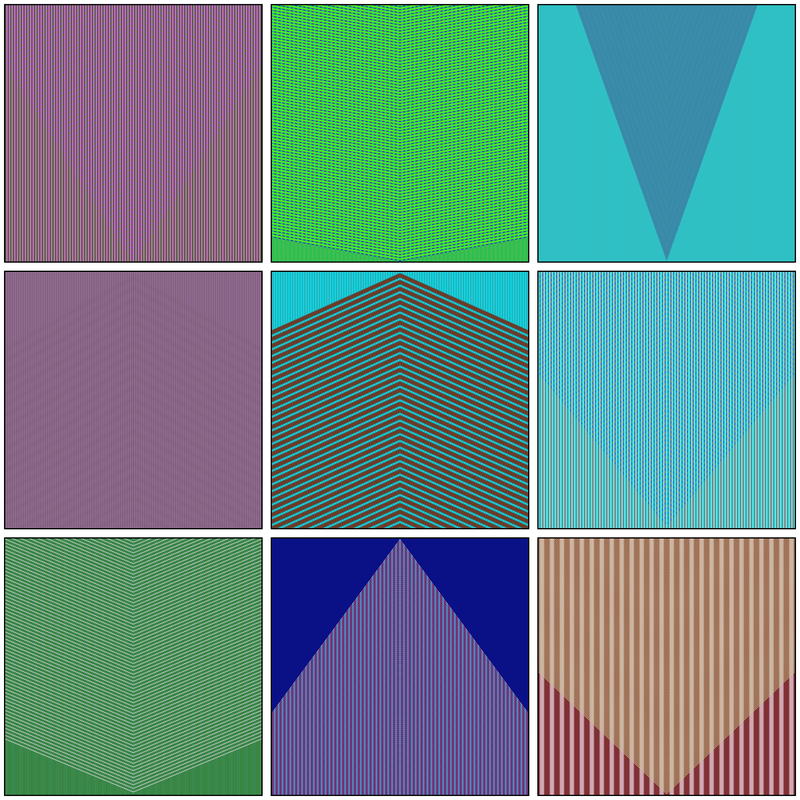 I’ve included a couple full resolution images for the new square screen at the bottom of this post. 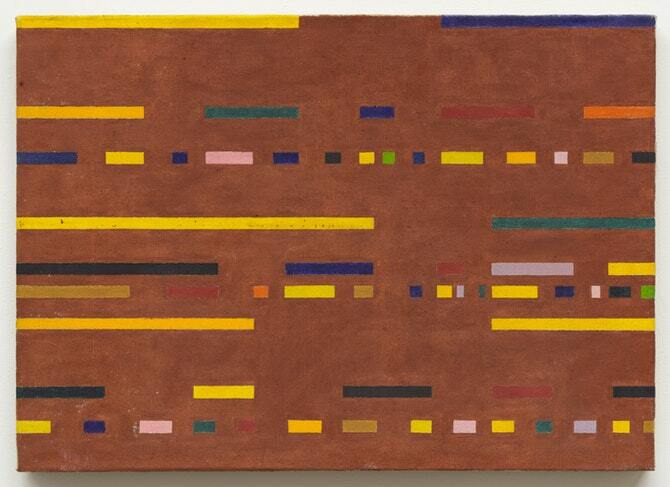 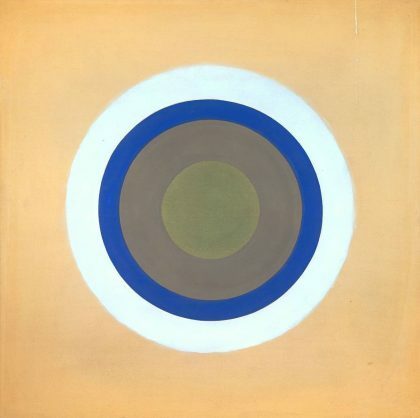 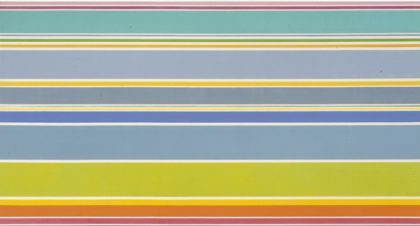 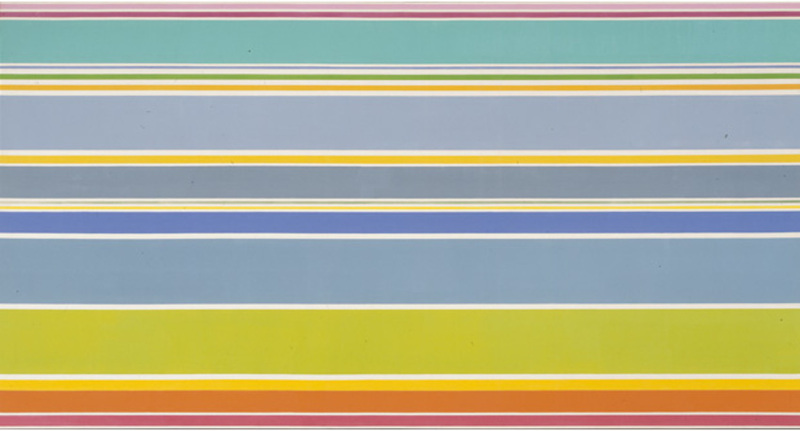 I don’t really have anything to write about Kenneth Noland on a conceptual level; the variety of his work is very interesting in the context of the ZF. 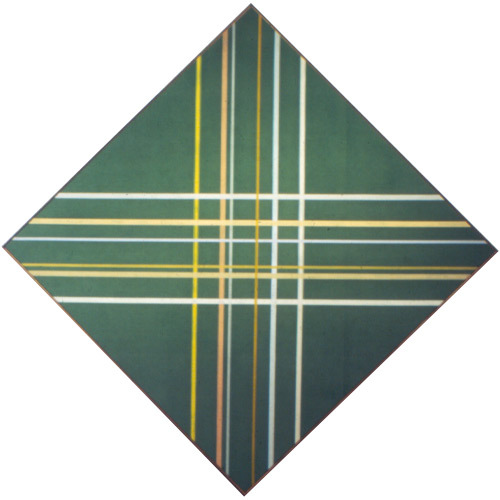 I chose three bodies of work to show different possible directions of structural exploration. The ‘target’, in particular, is interesting since technically, it’s stripes using a polar coordinate system. 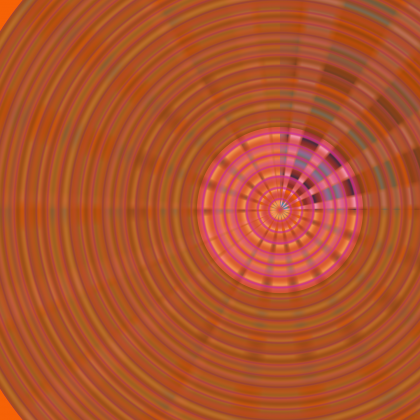 This means it should not be very difficult to explore some of these structures. 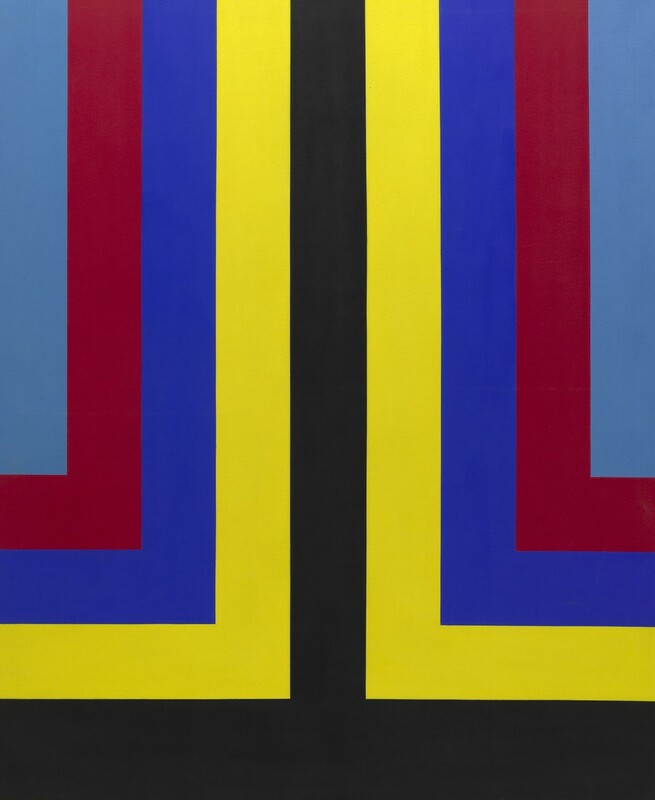 It is probably my bias towards these particular painters, but I continue to be surprised to the degree I find an affinity with their processes and artistic intentions, especially considering the gap in time and media. 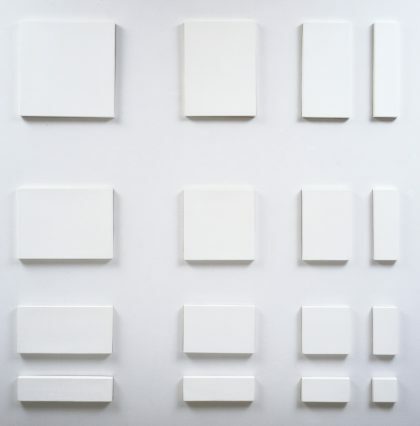 Kelly shares with me an interest in an artistic practise that is “impersonal” with an emphasis on “anonymity” (ambiguity in my interpretation) and a rejection of “expression”. Kelly often finds formal inspiration in the world around him, that is then abstracted in his painting process. 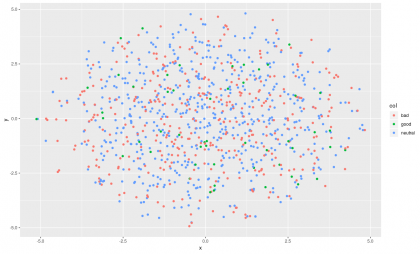 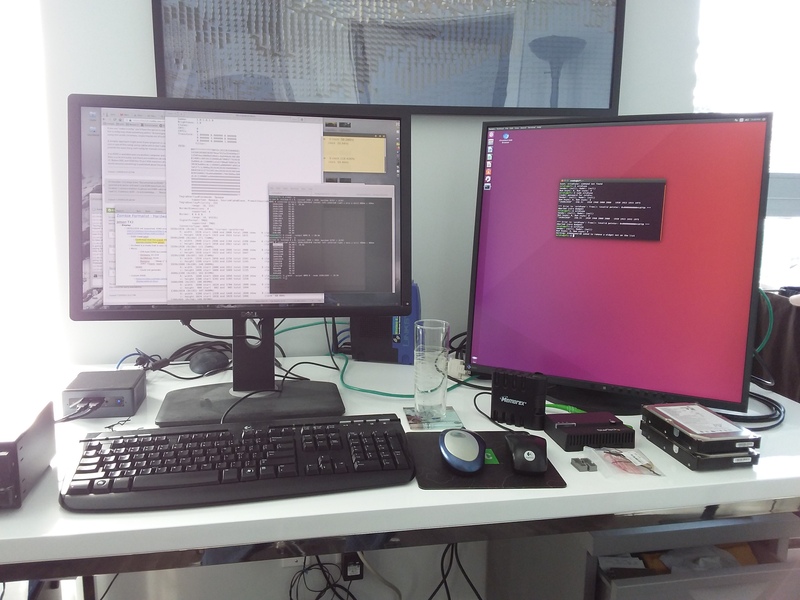 This seems quite interesting in the context of my machines using cameras to capture their environments in order to generate novel forms, images and structures that are not predictable nor perfect representations of the world. There is also the inquiry into objects, perception and the relation between form and ground that connect deeply with my works framed as “Subjective Machines”. 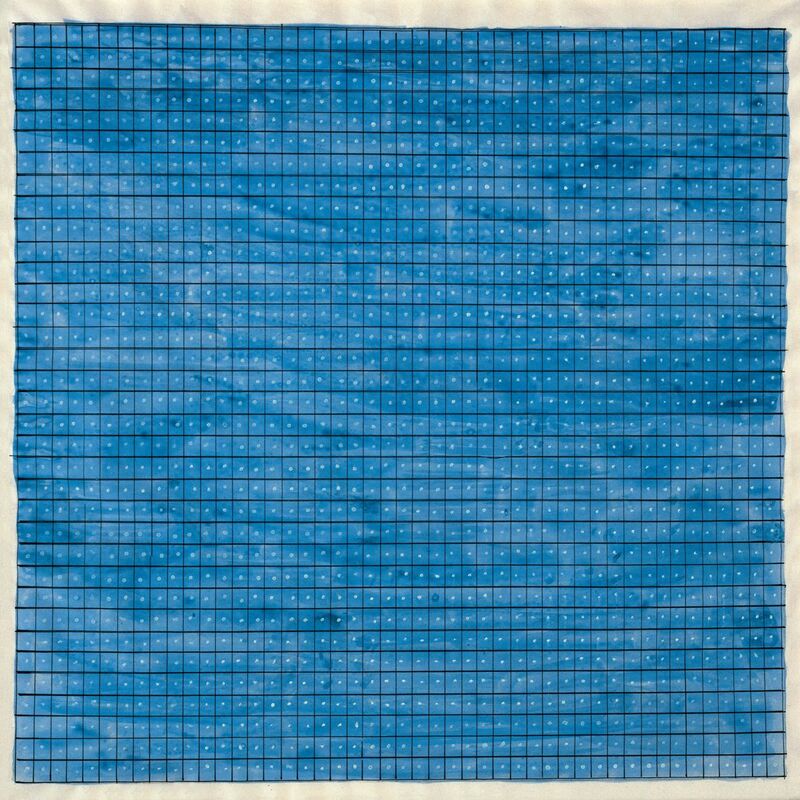 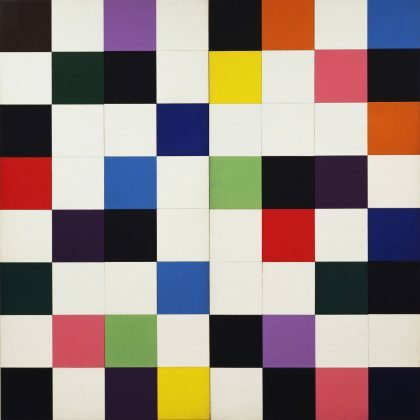 Kelly and I also share and interesting emphasis on fragmentation, especially in the context of his early work with collage reconstruction and the use of chance operations. 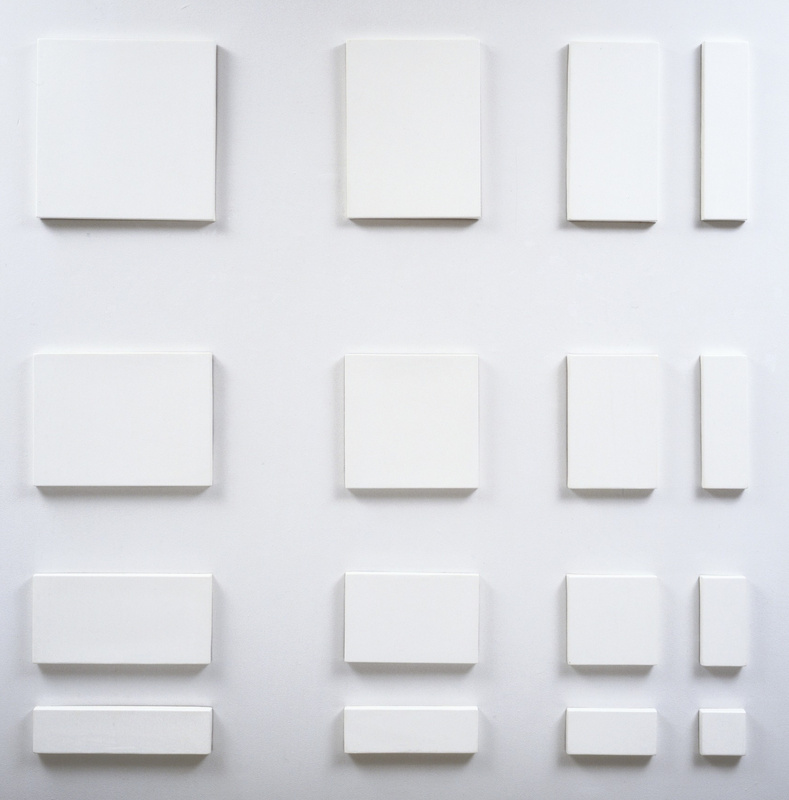 Kelly’s interest in autonomy where a work “adjusts itself” and his use of chance are highly relevant to the ZF. 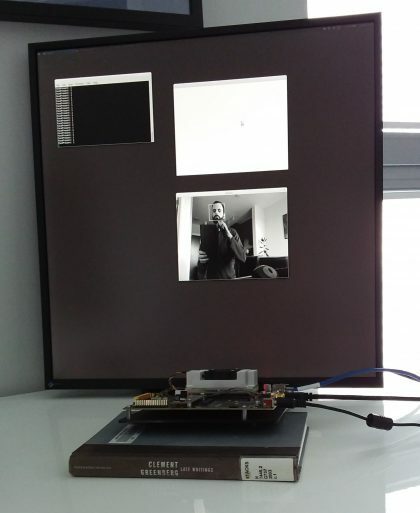 As is also his interest in anonymity and the impersonal. 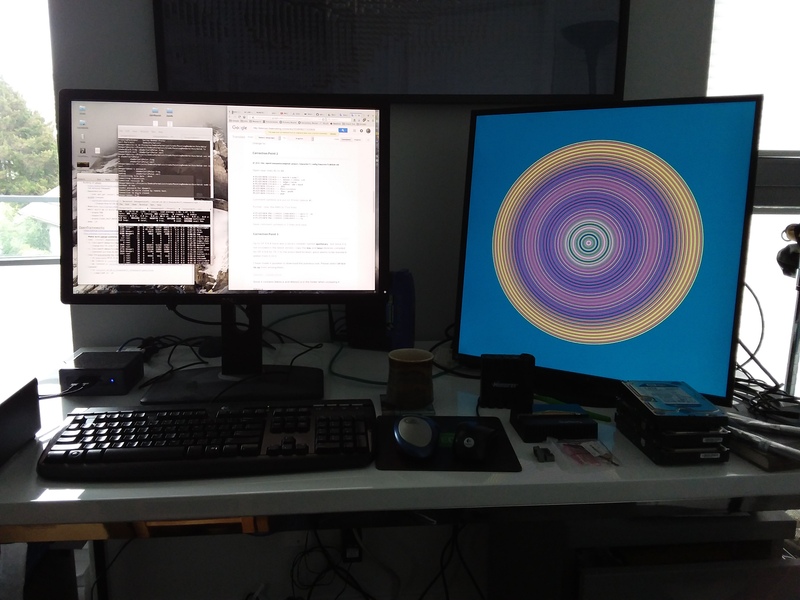 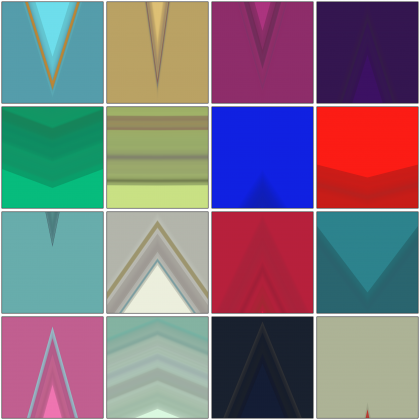 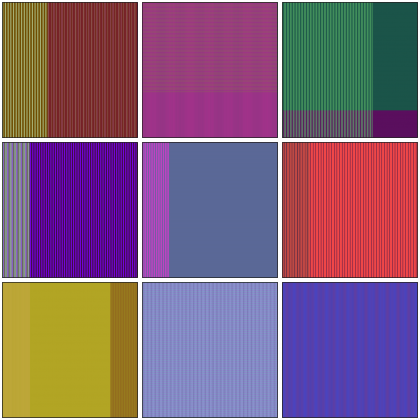 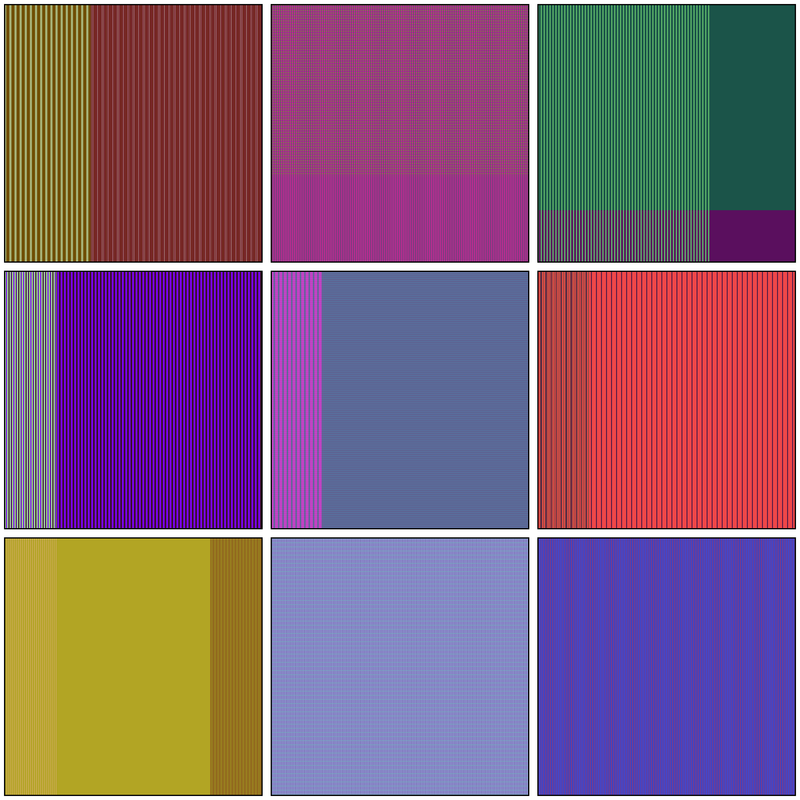 After my last post on Karl Benjamin, I modified my stripe code to increase density and the following images show a selection of the results. 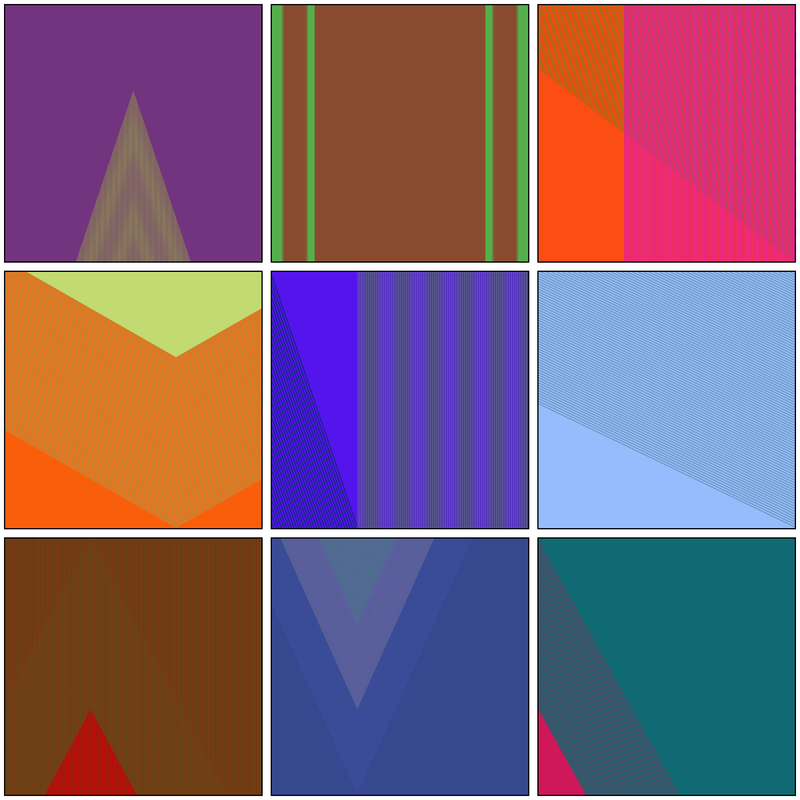 Compositions are selected for variety and not necessarily aesthetic success. 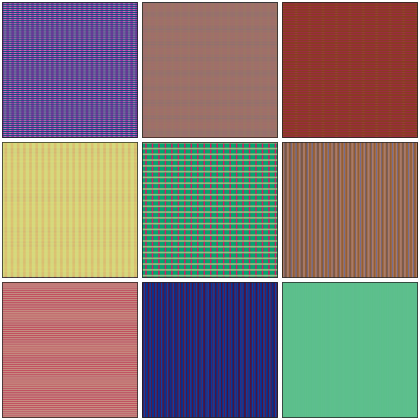 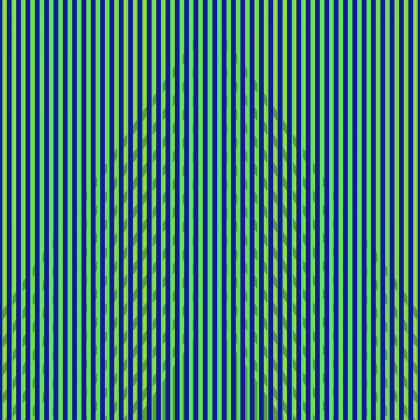 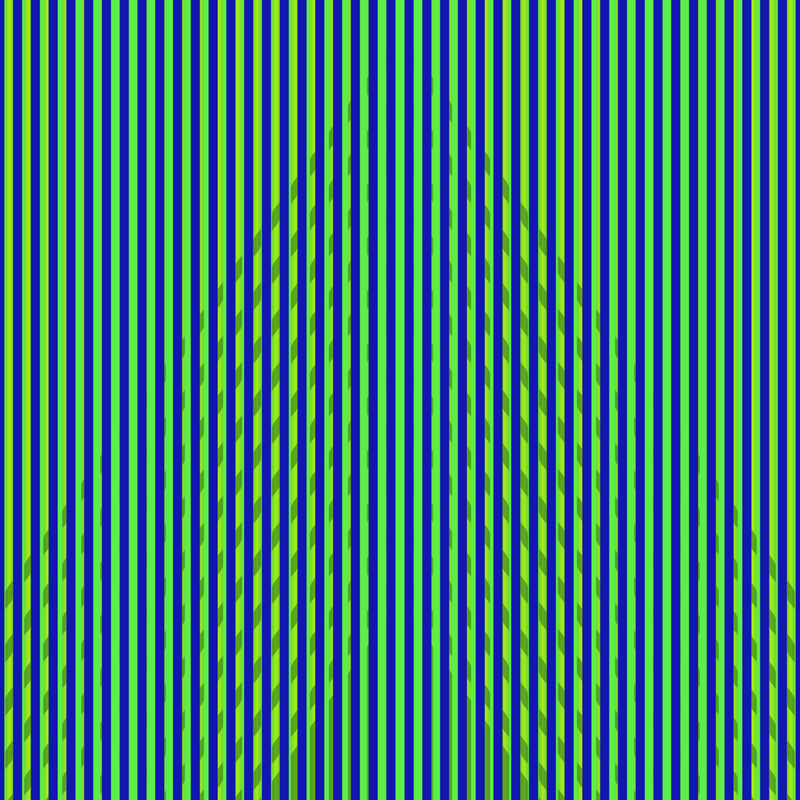 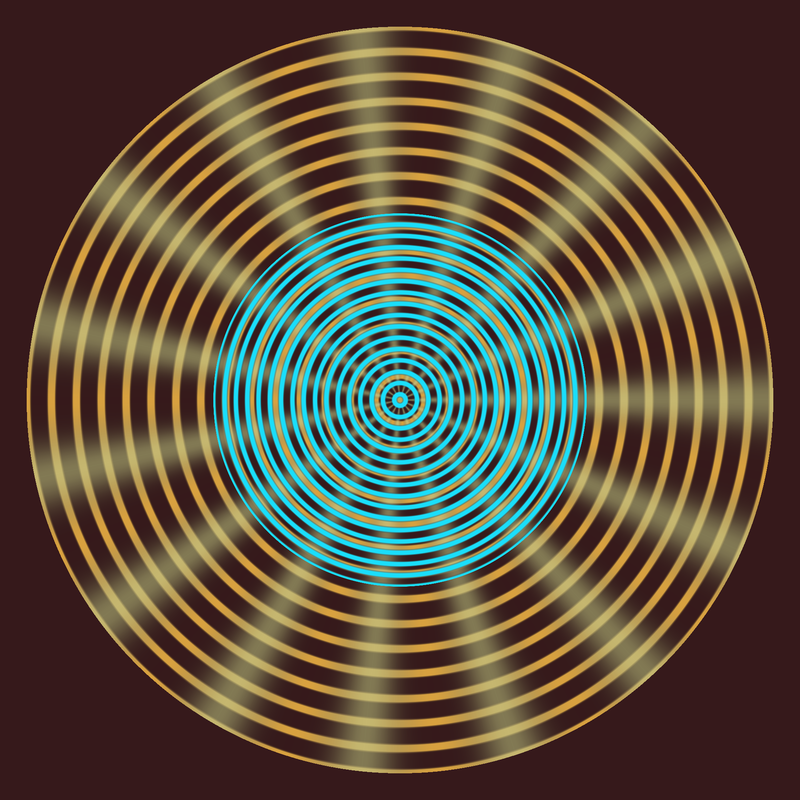 The code in the first case draws 25 stripes, but since the width of stripes could be as wide as the whole picture plane, many stripes are occluded.